Have you ever started out on a new path, a new philosophy or even just tried to introduce something new at work. Maybe it was a simple as trying to convince your bosses that “Dress Down Fridays” are a good idea and won’t tarnish the firm’s image. And did you notice what your idea had to go through to be accepted? Your well-meaning friends and family might well (in the nicest sense of the word) — ridicule you. Sure, it won’t be so overtly obvious as to poke fun necessarily (although maybe, if you’re unlucky), but it will be more subtle. “Really, you?” or “I don’t think that will work.” “Are you sure you’re up for that.” Or any other phrase along those lines. Fear not, this is just part of the process though. And rejection. You’re trying to get that dress down Friday thing started and half the managers want your head for it. You start sending your manuscript off to the publishers and agents and get rejection letter after rejections letter (yes, that’s still me!). Or you try and convince your old friends to try that new vegan restaurant because really, there’s not much on the menu that you can all eat at the local Argentinian steak house — and they look at you like you’ve just removed their kidneys! Yes, there will be those out there that will resist any new idea, philosophy or endeavor. But eventually, if you persist, you’ll eventually end up at stage number three. It will become self-evident reality. We’ll forget that there was ever a time when we didn’t have a dress down Friday, or when we used to smoke indoors or that people used to watch movies on cassette tapes (and have to re-wind them after use). The change will have become permanent (at least for the time being) and people will not even remember a time when it was any different. You see it all the time, whether that’s making people wear seat belts, getting them to smoke outside or hiring people on LinkedIn. 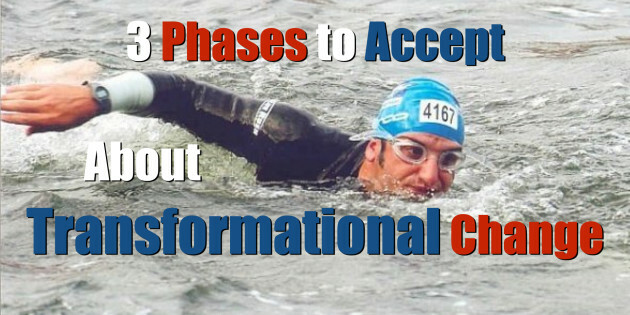 Transformational changes go through these stages. So what’s really the point in all this? Well, it’s to emphasize to YOU, that if you are doing something radically different from the norm, pushing your comfort zone boundaries and looking to make a few waves, learn to recognize where you are in the three stages of Ridicule, Resistance or Reality. Often it’s tempting to give up at the first or second ‘R’ without realizing that the third ‘R’ awaits you. Keep this in mind and keep challenging your own status quo.